Actually, it was the subtitle of this book that caught my attention: 30 Projects That Integrate Technology into Core Lesson Plans (although both the title and the subtitle are mouthful, almost as if Fiona Apple were in charge). That said, this handy resource book covers a lot of ground around ways that technology and media tools like Google Earth, Storybird, blogging and wikis and more can be used by teachers to engage students around the Common Core learning standards. Each section is set out with a very basic format, and the writing — while not that exciting — is straight to the point, which is what you want in a resource guide. The book is put out by the Ask a Tech Teacher website, and the introduction reminds teachers that technology should no longer be a separate activity; Instead, as reflected in the Common Core and many state standards, technology and media production are part of the whole literacy package that students SHOULD be using for reading and writing, and listening and speaking. The 30 lessons in this book provide a helpful framework for teachers who are wondering where to even start, and the writers provide links to paid software and web resources, but also alternative free possibilities, too. I appreciated that. 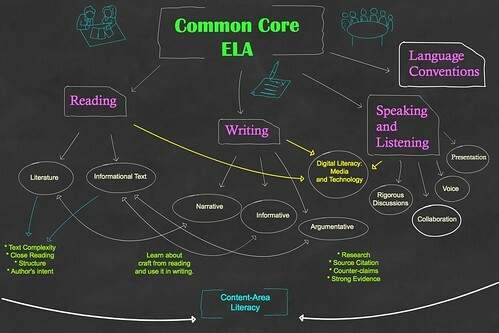 If you spend any time reading through the Common Core curriculum — and I mean reading deep into it, not just the standards — then you come to realize just how much emphasis is on the aspect of career readiness when it comes to learning — almost as much as college readiness, but not quite (I think college still outweighs career in the standards). So much of the learning objectives revolve around getting students, even young kids, ready for their lives of work in the world, and I often have a hard time keeping that goal in mind when considering my 11 year old students (and this is one of the striking criticisms of the Common Core — that it is not so much about learning in the moment but more about learning for the future). I know I am planting seeds here in sixth grade, and I know I want them to have a productive and enriching life. I know I have a part in that. It’s just hard sometimes to see that bigger picture. This is a very roundabout way to talk about a colorful advertising flier (complete with fake Angry Bird-like creatures on the cover) that came in the mailbox the other day. It is promoting an event for business leaders called “Social Media Marketing Conference” in a nearby city. After doing some digging around on the Web, I found it is being put on by a company that helps businesses with marketing campaigns. Responses can be automated—but should they be? Those are all good skills to have, no matter what field you are in. I’d love to just pop in and hear that sessions, you know? I also can’t help but think: those are almost the same titles of sessions in educational conferences I have attended in the past few years, with a few wrinkles designed for the business audience as opposed to an educational audience. These sessions center on writing persuasive text, reading for content, collaboration with technology, and use of informational text and media for purpose. Sound familiar? That’s the crux of the Common Core. I’m not sure what big point I am trying to make here about education and the world of work, other than noticing that businesses are expecting graduates to be using social media and technology for specific aims (even as we often warn students about how they are using social media), and I wonder how many students in high schools are considering how their social media lives might help them land a good job. Meanwhile, those same students need to learn the filters that can weed through the drone of business tweets, Facebook likes, and more that are clearly becoming the norm of the advertising world, and growing every day. Our students need to be armed both for getting jobs and for media-blitz advertising, and be able to take advantage of both. One of my weaknesses in teaching is clearly research. I admit it. I’ve certainly taught research skills, and have students use research in writing, but I have never been all that comfortable with figuring out the most effective ways to get my students using the Internet for solid background knowledge gathering and evidence to use in their writing. Partly, it is me. But it is also the ‘wild west’ nature of Search Engines, and the lack of focus that Google and Bing and others bring to the table for young writers. Still, with the shift of our state into Common Core, which has a huge research component to it, I know I can’t let this part of the curriculum slide. I need to teach them basic research skills. It’s as simple as that. So, when I heard about InstaGrok, I was intrigued. It is billed as an online research tool for students, which focuses search content, but still brings in video, images, websites, information and more. (Plus, the site creates an interesting interactive quiz area, where students can test their expertise). And what is best of all — the site archives and collects notes that students want to remember and use in later writing. Last week, I set up a classroom account in InstaGrok (in a matter of minutes) and after a period of “playing around” with the site, I had them working deep on an environmental essay project. By setting up a teacher account (which is free, as is the entire site … at least for now) on Instagrok, I can get a bird’s eye view of the research being done by my student, and even glimpse inside their journal, where they are collecting notes. I can pop in, as I did over the weekend, and get a sense of each student’s progress on the project, and notice areas where I need to do a little more one-on-one teaching, or checking in with them this week. And the students are loving InstaGrok, too, and some are using it at home, showing their parents. You can tell I have the Common Core in the back of my mind with today’s post but my wife and I were out buying a new car yesterday (our old car lasted us 18 years, so this is a big deal for us), and it occurred to me that many of the skills that are now embedded in the new standards actually came into play as we got ourselves ready for a real-life situation that neither one of us enjoys. First, we had to do a lot of research on the kind of car we wanted. This involved many hours of online searching (and the need for skills in those researching hours). We collected various strands of information and shared them with each other (through Read it Later bookmarking browser add-on, mostly) and had to “read” informational text to understand the features of the cars that are available in our price range. Second, we had to sit down and persuade each other about the price range of the car we could afford. This involved a little argumentative talking (but only in the persuading fashion) and then some ideas around the economics of raising a family of five, and whether a new car or used car made more sense for us. Third, after agreeing on a brand of car, we both got jittery about having to negotiate with a car dealership. So, back to the Internet, to search for “Ways to Negotiate the Price of a Car.” I found a great website that walks you step-by-step on negotiating strategies and expectations of questions (which it got almost exactly right), and how to turn the situation into your advantage. I also went back for more research on prices, so I would be armed with pricing knowledge. Fourth, we talked through how we would approach it on the drive to the dealership, explaining whose role it was to be the test driver (hers) and whose role it was to be the one who negotiations (mine). We also read again a print-out of the website about how to buy a car. 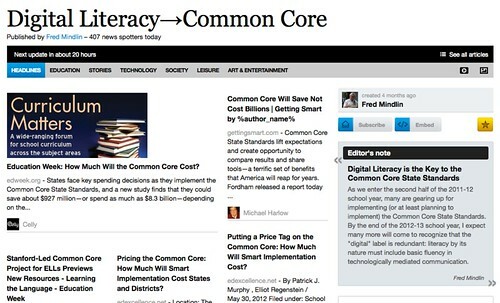 One of the philosophies of the Common Core is real-life applications of literacy as well as college/job readiness. In our Massachusetts version of the Common Core, the Guiding Principles are all about how literacy impacts life, in its many facets. All of those skills were critical to us walking away from the dealership with a car that we wanted at a price we were happy about. If that isn’t an example of how literacy is important, I don’t know what is. Each week, I meet with my grade level colleagues for a Community of Practice meeting. Yesterday, they asked me to bring some information about the PARCC assessment now under development as it pertains to our sixth grade. They know I have been diving into the Common Core, PARCC and all that to get a handle on the direction our state is going (moving into full implementation of Common Core and PARCC looms on the horizon). We, as a team want to be ready, knowing that in two years our entire testing system is going to likely change. I shared the two images above with them. These come from the PARCC site (Partnership for Assessment of Readiness for College and Careers), and the assessment criteria and system is still in draft stage at this point. But there is enough of what is being talked about being made public now to understand the general shifts that are surely coming our way, and soon. For us, we have been using our COP time this year and some of last year to begin talking about how to teach literacy skills in the content areas, and certainly, we have beefed up writing assignments and instruction in ELA, Social Studies and Science. We’re sharing and developing common rubrics and communicating more about assignments that touch on the skills, and how to best coordinate those activities together. (We could still do more, though). 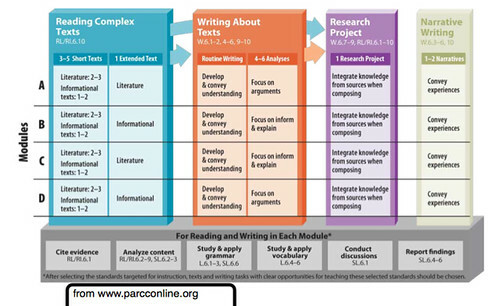 As we perused the PARCC materials, it became clear to all of us that we will need to be doing a lot around teaching critical research skills to our students. We know this is a weak area for us. And in talking to other teachers and working in other districts, this seems to be a common area of weakness. We’re lucky in that our librarian/media specialist does work with our students around issues of research and citation, but her curriculum and lessons are fairly isolated activities. In other words, her unit is not really tied to an authentic assignment in the sixth grade classroom. 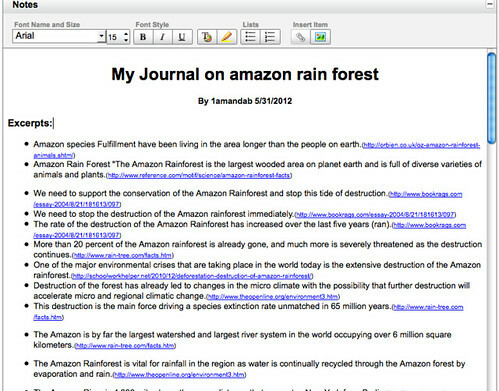 I’ll be doing a bigger push this spring in ELA classes around research strategies, the Internet as a source, and citation as part of an environmental essay/multimedia project that brings together a lot of components from the entire year around writing. In the past, I have touched on these issues of research but focused mostly on the writing. With PARCC and the Common Core, research is clearly a big part of the learning, and students must use what they have found to create a powerful argument on a topic. 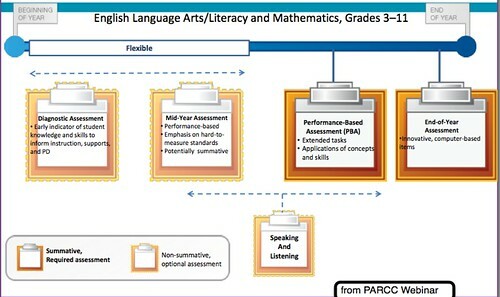 If you look at the Assessment Chart, you can see that a large project is the main assessment of skills under PARCC. Research and argument is at the heart of the expectations, as far as I can tell. Talking with my colleagues made it clear we all have some work to do in this area. I think we are up for the challenge even as we are wary of the shifts in the political winds. We see the benefits of some of the changes — research is important; argumentative writing is powerful; literacy in all content area classes is crucial; etc. — yet we remain uncertain of where it will all shake out.